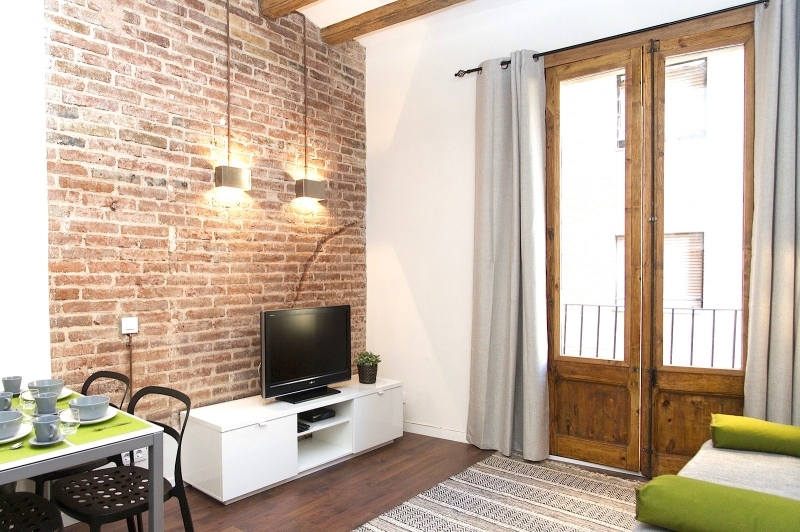 New apartment of 40 m2 with lift, located in a very peaceful, cozy and tree-lined pedestrian passage, only 300 metres from the emblematic Sagrada Familia Basilica. It has a modern design and decor and a maximum capacity of 4 people, ideal for couples or families with children. 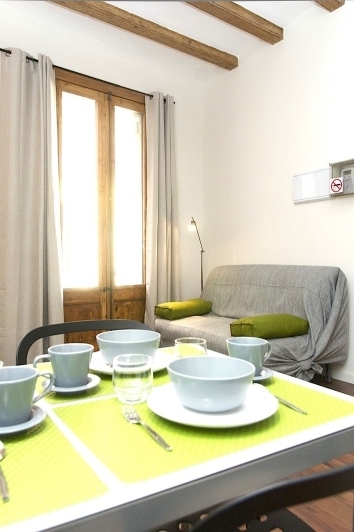 double bedroom with a double bed, a bathroom with shower and a small laundry room with a washing machine. Features include: exposed wooden beams, preserved original stone walls, parket flooring and tasteful decoration creating a welcoming and homely environment. Very locally you will find shops, supermarkets, pharmacies, health food stores, banks as well as the public transport: bus and metro. The nearest metro station is: Encants (L2) and Sagrada Familia (L2 and L5), so well connected to the whole city. Situated in a major tourist area due to its proximity to many attractions, excellent nightlife, great bars and stylish restaurants. Also within a radius of 3 kms are Passeig de Gràcia, La Pedrera, Casa Batlló, Park Güell, Plaza Catalunya, Las Ramblas, La Boqueria, El Borne, Barcelona Cathedral and Estació de França. Sagrada Familía is a neighborhood in the Eixample district of Barcelona. Its name comes from the church of the Sagrada Família, work of Antoni Gaudí, which can be found in the center of the neighborhood. In 1882, the original Sagrada Família Gothic church project, designed by Francesc de Paula Villar, was taken over by the young Antoni Gaudí, who transformed it into the most fascinating church of all time. An architectural bible called the Sagrada Família which has become a Barcelona icon. The building, which is still under construction, has lent its name to the area and made it world famous. After all, the Sagrada Família is a vibrant neighbourhood with its own unique personality. The Avinguda Gaudí, a delightful pedestrianised boulevard, links the basilica with the Hospital de la Santa Creu i Sant Pau, the most representative civil building from the modernista period, designed by Lluís Domènech i Montaner. Both these outstanding modernista landmarks have been declared UNESCO World Heritage Sites. In this popular district you will find a wide range of typical Catalan tapas bars, cafés, restaurants and souvenirs shops. It's a perfect choice for a peaceful stay in Barcelona!